NOW: The combined, for some, claustrophobic and vertiginous effects of Jean Sherrard’s “now” must be endured, for - if we have figured it correctly - by standing at the eastern edge of the I-5 freeway pit where Roanoke Street crosses above it, he is no more than a bicycle pump throw from the prospect taken by the unidentified historical photographer he repeats. Most likely that is the half-way turn sign showing in our “then.” Although with inhibiting directions, Jean Sherrard’s signs are very close to the mark for a proper contemporary repeat where Roanoke Street heads east from Boyston Avenue first bridging Interstate-5 with an overpass. More evidence for this conclusion is included in a 1953 Seattle Time’s feature researched and written by Lucile McDonald, for decades this newspaper’s prolific heritage reporter. Shirley Jean. A few illustrated feature’s from past Pacifics – stories that stay near the bike path to Lake Washington. First we will show off George Cotterill, the progressive engineer-politician who took charge of building the bike trails – and much more. 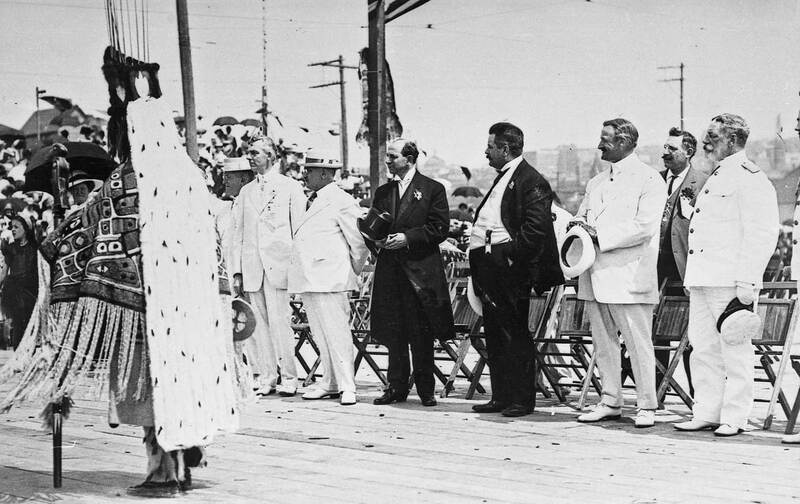 George is in substantial profile, right of center and in an opened dark suit with a white shirt showing. Here follows another look at the split in the path – near Roanoke. This was photographed by A. Wilse sometime before he returned for good to Norway in 1900. It is not such a good photograph, which suggests that it is a generation or two down the line from Wilse’s normally sharp recordings. Next a 1905-6 look at the Roanoke neighborhood – from Queen Anne Hill. This you might wish to click TWICE to enlarge. You will note on the far shore an imposing classical revival mansion, one we will soon examine up close. It still stands at the northeast corner of Harvard Ave. and Edgar Street. Also far right is the then new Seward School’s second plant. (We include a thumbnail history of it below.) The “Wallingford peninsula” is on the far left, as yet without the 1907 Gas Works. Note the undeveloped and irregular shoreline across the lake. The Latona Bridge is there – it is still about fifteen years before the University Bridge was constructed, and when this scene was recorded the University District was still as likely to be called University Station (after the trolley), or even Brooklyn, the name chosen for it by its developer in the late 1880s. The mansion on Harvard at Edgar stands here above the subject’s center. 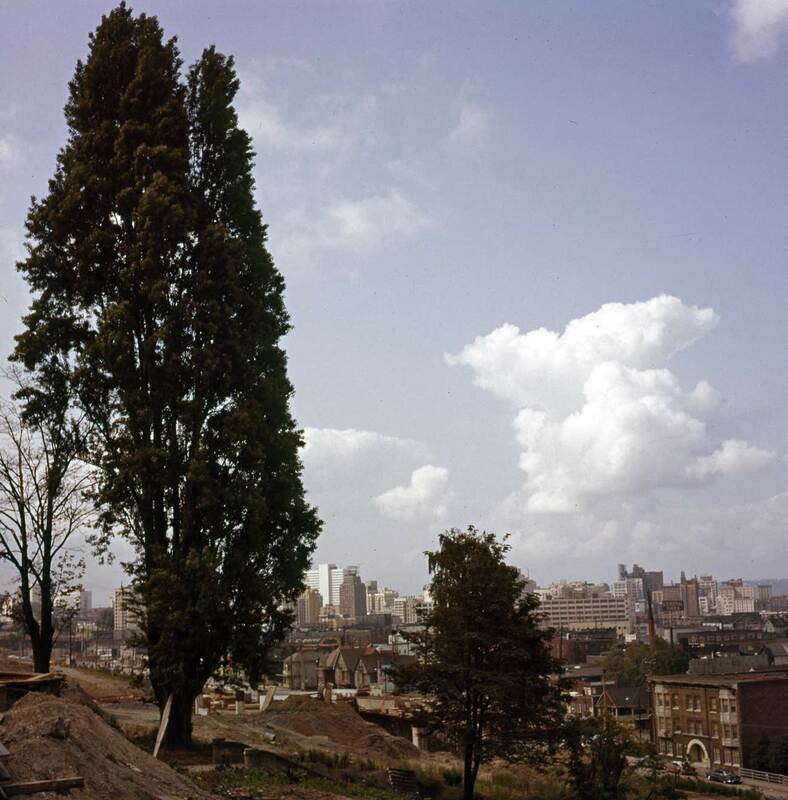 This is part of a 1910 panorama taken, again, from Queen Anne Hill. Roanoke Street is on the right. Nearly clear-cut, Laurelhurst shows a few tall firs kept – for some reason – far left. Next is a montage that confesses how Jean and I discussed how to proceed with his “repeat” photo. The parts of this paste-up include a portion of the map made of the bike path when it was new, a reduced copy of the primary “then,” and a grab from Google Earth. As it developed we decided to take the “now” not from Edgar – where the red arrow points – but rather from Roanoke. Now we will visit a Golden Potlatch party on the lawn of the Ann and Edgar Webster home, which was north of (yes) Edgar in the block between Harvard and Boylston and so now in the air over the south approach to the Lake Washington Ship Canal Bridge on I-5. 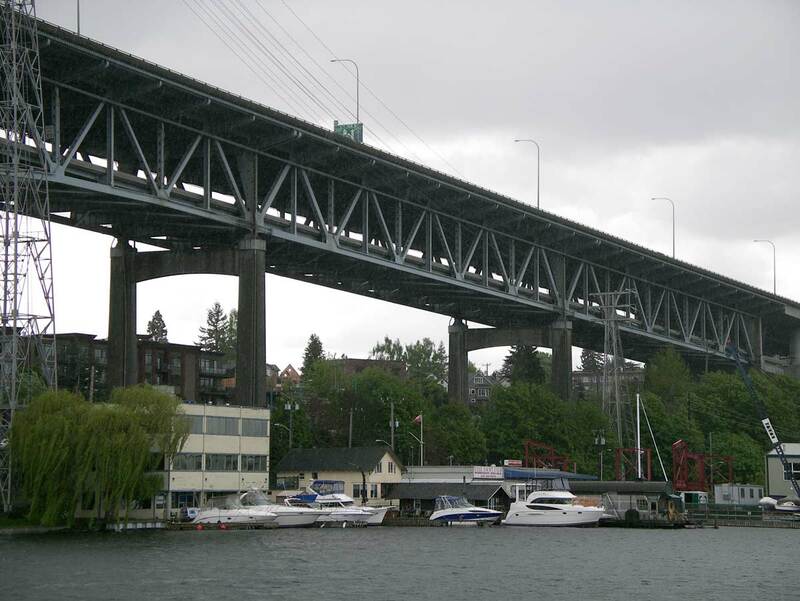 On the afternoon of July 17, 1911, Ann and Edgar Webster hosted a Golden Potlatch party for more than 500 guests on their sprawling lawn, which is now - we like to repeat - “in the carbonated air” suspended above the south approach to the Lake Washington Ship Canal Bridge on Interstate-5. 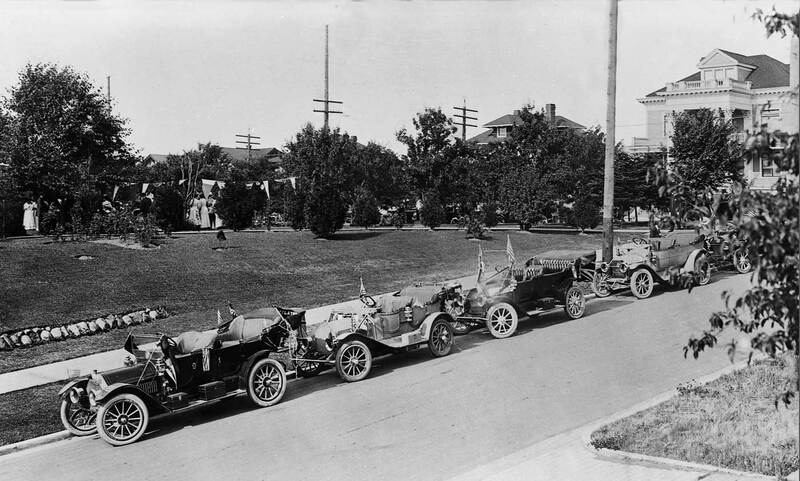 The Edgar Street block between Boylston and Harvard Avenues (also now only imagined) was "decorated" with the parked touring cars of potlatch dignitaries. The Parsons Mansion across Harvard Avenue appears upper-right. (First appeared in Pacific, June 3, 1990.) The above scene of a line of Luxury motor cars parked in front of an expansive Capitol Hill lawn appears near the front of a thick photo album recently discovered by a local collector, Michael Maslan. 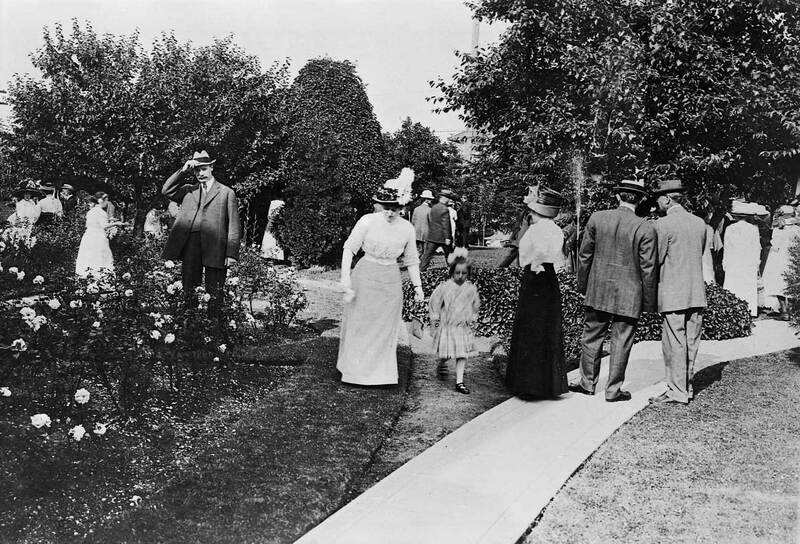 The wide lawn belonged to Edgar and Ann Webster, and so did the album, full of scenes from the city’s summer festival in 1911, the Golden Potlatch. 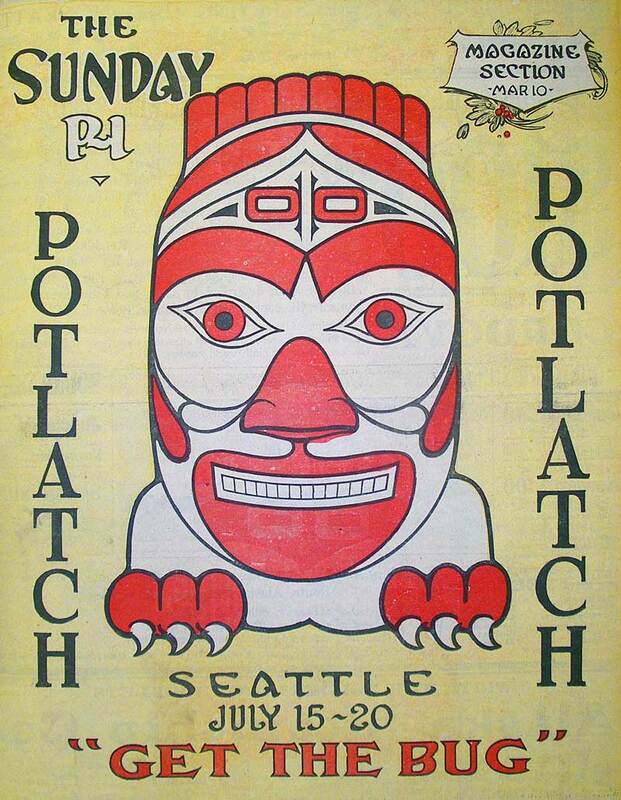 Most likely the album was a gift from the potlatch organizers, for the 51-year-old Edgar Webster was elected King Edgar d’Oro of the week-long festival. The affable Edgar was an appropriate choice for an event that celebrated the city’s rise over the territory of Alaska. Edgar Webster was New York Life Insurance’s general agent for Alaska and the Yukon Territory, and part owner of the Washington-Alaska Bank in Fairbanks. 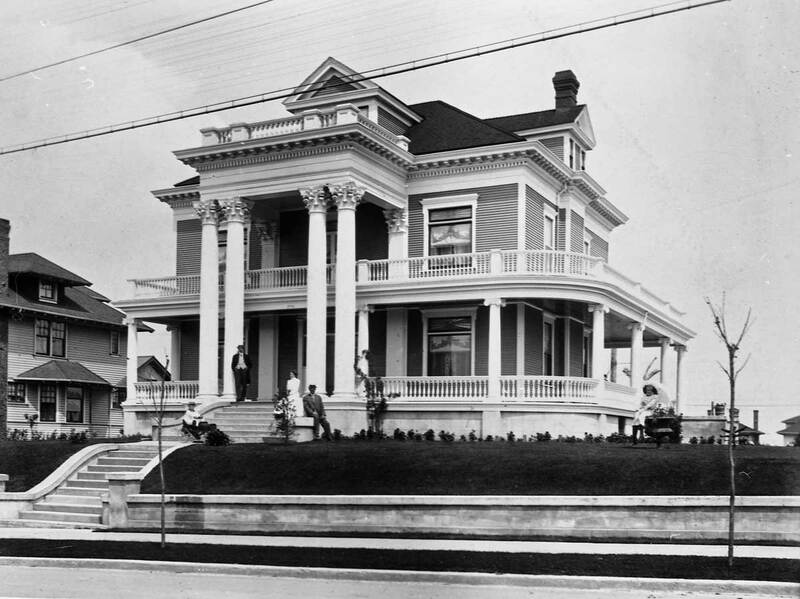 The festival’s first grand event was a Saturday, July 17, motorcade led first through the streets of Seattle and then over the city’s new boulevards to King Edgar’s mansion at, appropriately, 704 Edgar St. Although this scene does not include the Websters’ oversized home, which is out of frame to the left, you can see, on the far right, the stately neoclassical home of his brother-in-law, William Hinkley Parsons. 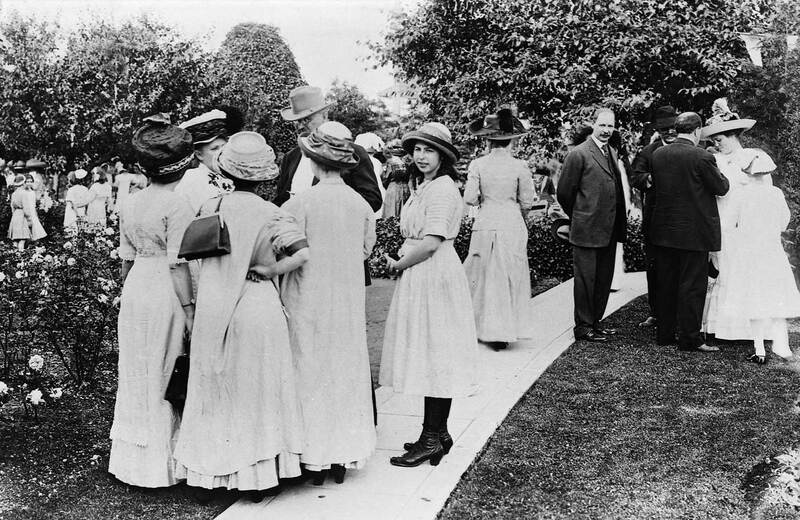 Ella Parsons helped her sister-in-law Ann Webster serve tea or punch with ice cream and cake to the more than 500 parading dignitaries. Follows next something on Webster’s relatives and neighbors across Harvard Avenue. This is the Parsons mansion that we have pointed out more than once above in the photographs taken across the lake from Queen Anne Hill. (Compliments of MOHAI). (First appeared in Pacific on July 8, 1990.) By any criterion the Harvard Mansion is a landmark, and its present owners are attempting to formalize that designation. 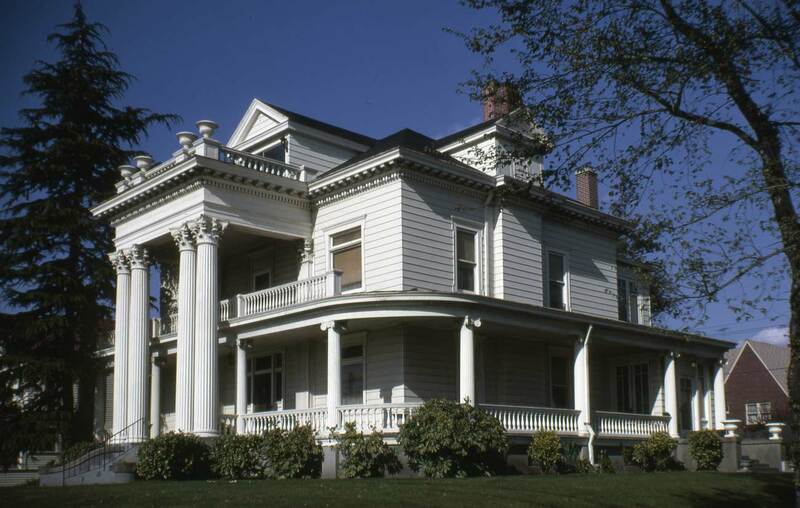 Its monumental Greek Revival portico looks west over Interstate 5 south of the Lake Washington Ship Canal Bridge and two blocks north of I-5’ Roanoke Street overpass. This showplace was designed and built in 1903 by Edward Duhamel for his use. The Parsons home in 1990 - long after they had left it. William Parsons retired from Seattle First National Bank in 1934. The following year the family moved to Washington Park, and for six years the expensive mansion stood vacant. Since it was again occupied in 1941, the Harvard Mansion has changed hands five times until last year (1989), when the present owners moved in and started their restoration and research project. 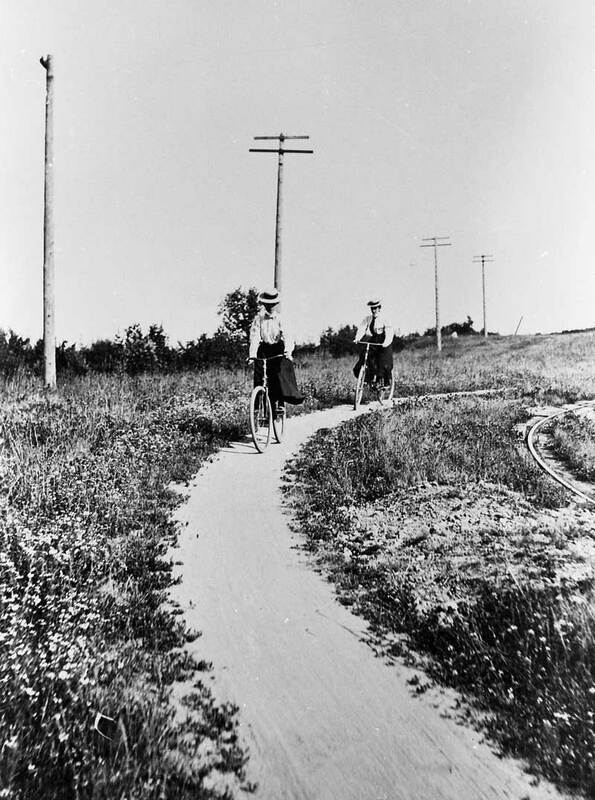 The energy given by local cyclists to funding and building the city’s bike paths developed into the Good Roads movement, which ultimately replaced bikes and exercise with motorcars and speed while sitting. 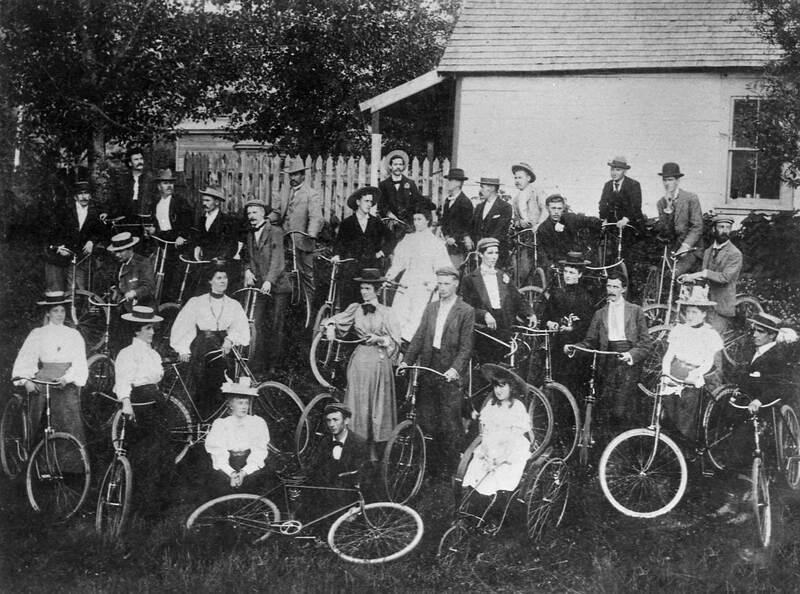 The local cycle clubs were often ambitious in their group excursions. Below is a portrait of club members draped about the large Kent landmark that was their destination. In 1896 it would still be four years before the first automobile arrived in Seattle. Another Puget Sound cycle club pose follows, although where I have no clue. Three maps now. First the local bike path map, drawn by the photographer A. Wilse. Following that a composite of the maps from the federal survey hereabouts that was interrupted by the 1856 war between some of the settlers and some of the Salish tribes. 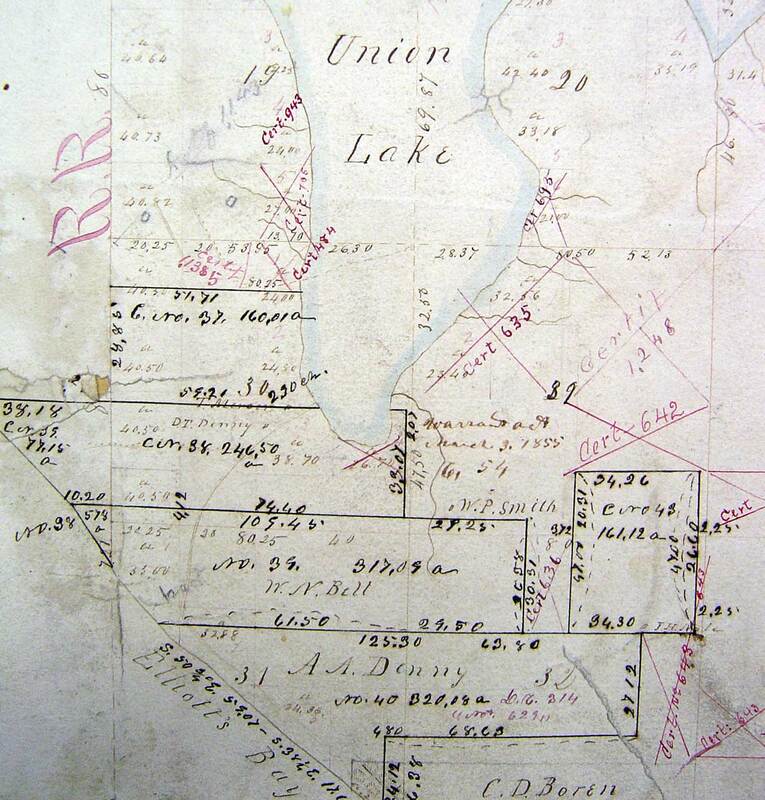 Like the surveyor’s map the third map that follows it is early enough to name the lake “Union Lake.” It shows a few of the original donations claims at the south end of the lake – however you wish to arrange its name. Next an early recording of the “east shore” of Lake Union – one, most likely, looking southeast across the passage between the lake proper and Portage Bay. 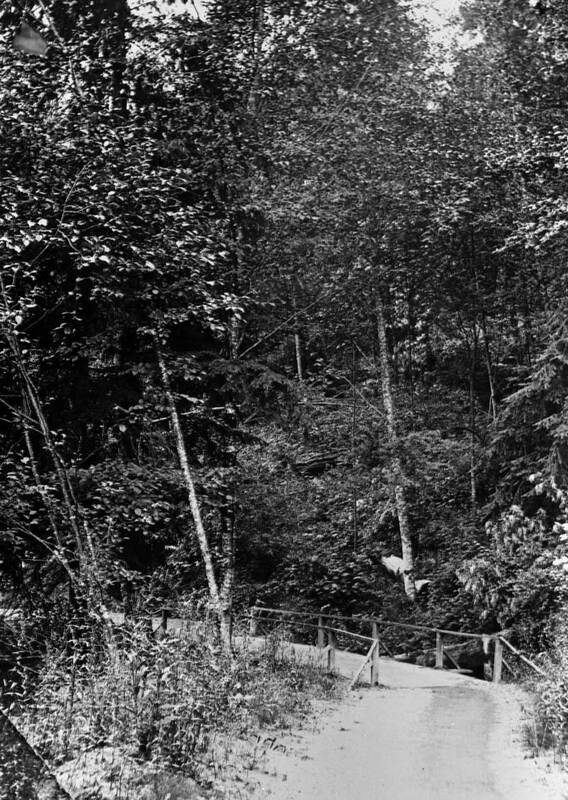 Identified as a scene on the east shore of Lake Union, the narrow passage in the above snapshot from 1887 suggests that it was recorded from somewhere near the west side of the University Bridge. For the “now” I photographed the “east side” of Lake Union from its north shore in the old Latona neighborhood near the foot of Fourth Avenue Northeast and within the bouquet of Ivar’s Salmon House. 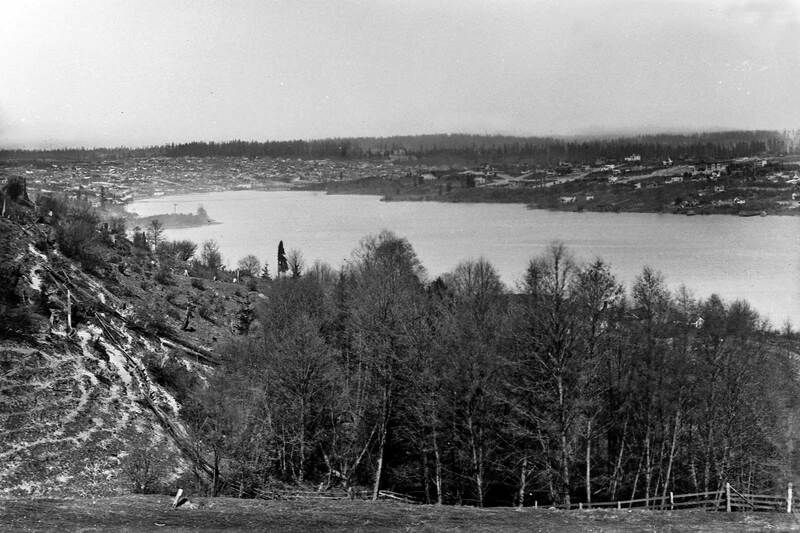 The earliest photographs of Lake Union are a few panoramas taken from the since-razed Denny Hill in the mid-1880s. None of those, however, helps identify this extremely rare detail of the lakeshore from such an early date as 1887. We can see that there has been some clearing of the forest back from the far shoreline, and in the immediate foreground a sawed-off stump nestles near a still-standing cedar. 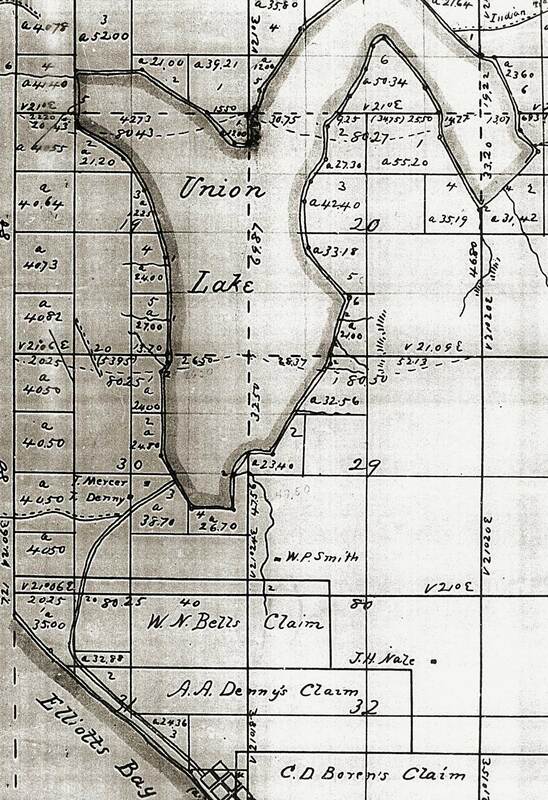 It was 1887 when the Seattle Lakeshore and Eastern Railroad was laid along the north shore of this lake through the future neighborhoods of Fremont, Edgewater (near Stone Way) Wallingford/Latona and the University District. 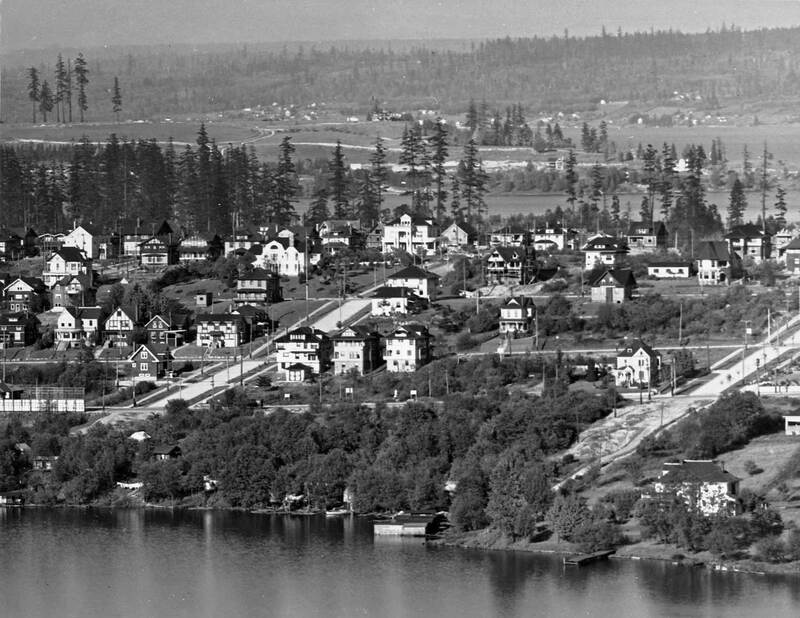 Perhaps the photographer hitched a ride on the railroad and took this snapshot looking southeast from near the little park that is now at the foot of Fourth Avenue Northeast, just west of Ivar’s Salmon House. 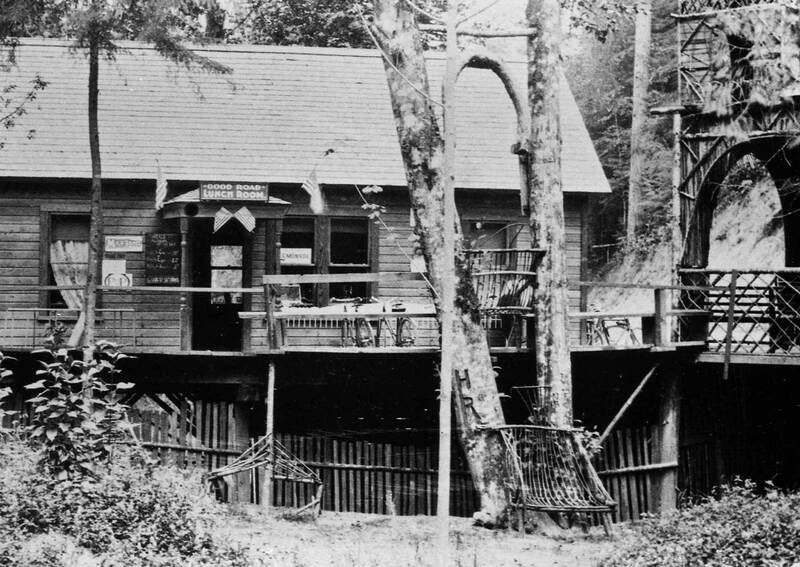 This conjecture may also help account for how, in the 1887 scene, the shoreline draws closer to the photographer on the left side of the cedar. 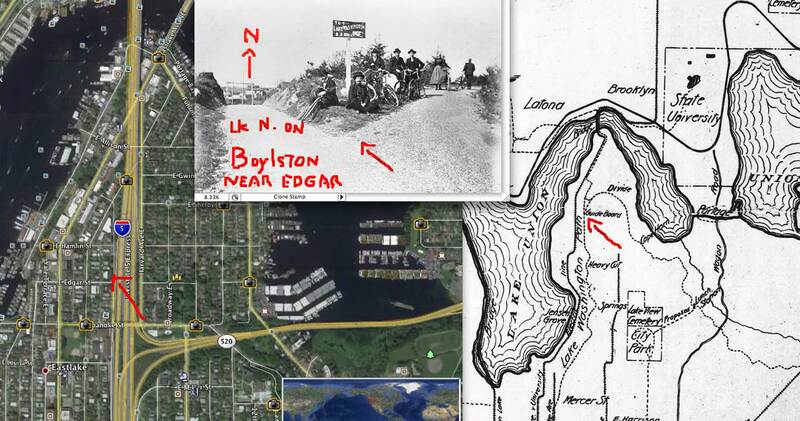 Historical maps of the undeveloped east shoreline of Lake Union show such an irregularity near where the Interstate 5 freeway bridge sinks its piers on the east shore of the lake. And so we feel somewhat confident that the right prospect has been found for the repeat. Next we turn to take the fork to the right and head for Lake Washington. Some of our stops will be known, other path photos will be introduced, which we hope were taken on the part of the path system that led to Leschi. (First published in Pacific, on June 23, 1991.) Throughout the 1990s, expect a proliferation of centennials in Seattle. It is a century since this city began its big boom in population and institutions. This year Seattle Preparatory School and Seattle University, both Jesuit institutions, celebrate together. 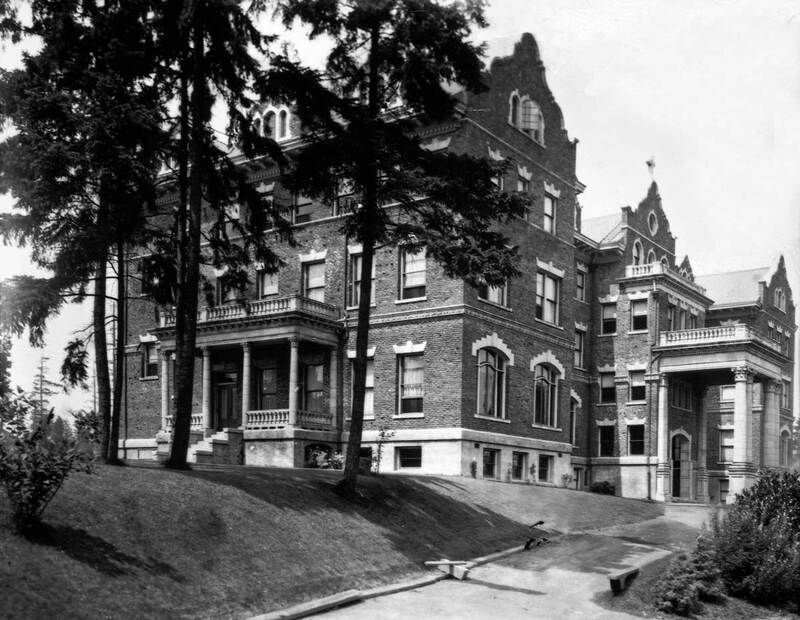 In 1891 the Jesuits took over St. Francis School, founded in the late 1880s by Seattle’s first Roman Catholic priest, the Rev. F. X. Prefontaine. Soon the order moved to the present site of Seattle University. When the institution moved again in 1919 to the north end of Capitol Hill, it was a combined college and high school. These, however, are not Catholics in this early view of the school’s Adelphia Hall but Swedish Baptists. Built in 1906 to train Baptist missionaries for Asia, Adelphia College operated until 1917, when World War I depleted the supply of male students. The site was then purchased for the Jesuits by a Catholic couple, Thomas and Elle McHugh, who lived on Capitol Hill. 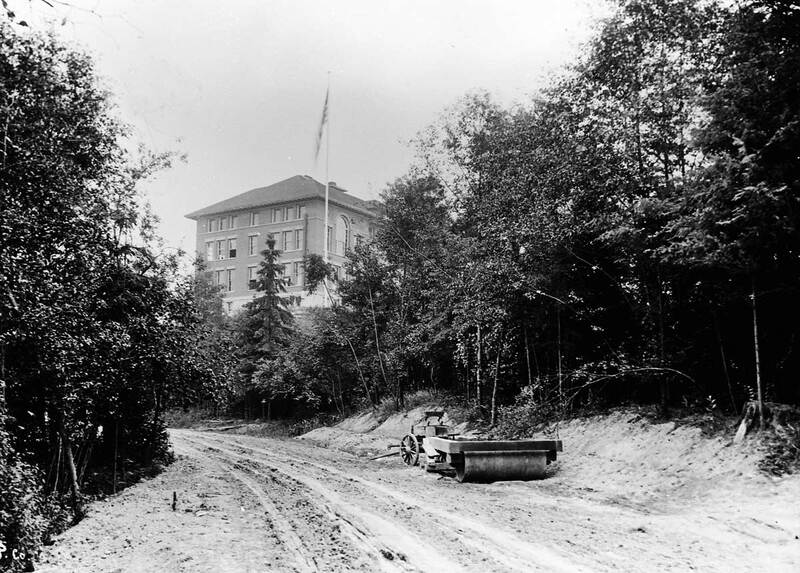 After Seattle College returned to its Broadway site in 1931, Seattle Prep was left to develop this Interlaken campus. A gym had been added in 1929 and after the 1949 earthquake shook the institution’s foundations, the austere, modern South Wing (Seen on the right of the contemporary scene – if we had found and included it.) was built between the original hall and the gym. Old Adelphia Hall’s roof was removed after the 1965 quake weakened its timbers, and in 1982 its facade was hidden behind the new McHugh Gymnasium. Earlier, in 1975, Seattle University and Seattle Preparatory School were united again in Matteo Ricci College, a program (with lots of home work) that graduates a high-school freshman from college in six years. Looking up at Adelphi Hall from what? This is the route of the Bike Path to Lake Washington, but it appears to be here in the process of being graded for motorcars. This seems likely because the hall was constructed in 1906, several years after the bike path was first put through. We continue a little distance to a prospect that allows one to look due north into the University District, aka then as Brooklyn. (First appeared in Pacific on Jan. 18, 1999.) This is one of the few easily identifiable scenes recorded a century ago by Seattle photographer J.F. Soule along the Lake Washington Bicycle path. Its view looks due north across Portage Bay in line with the University District’s 12th Avenue. This is also the earliest panorama of the Brooklyn neighborhood, as it was more commonly called in the late 1890s. 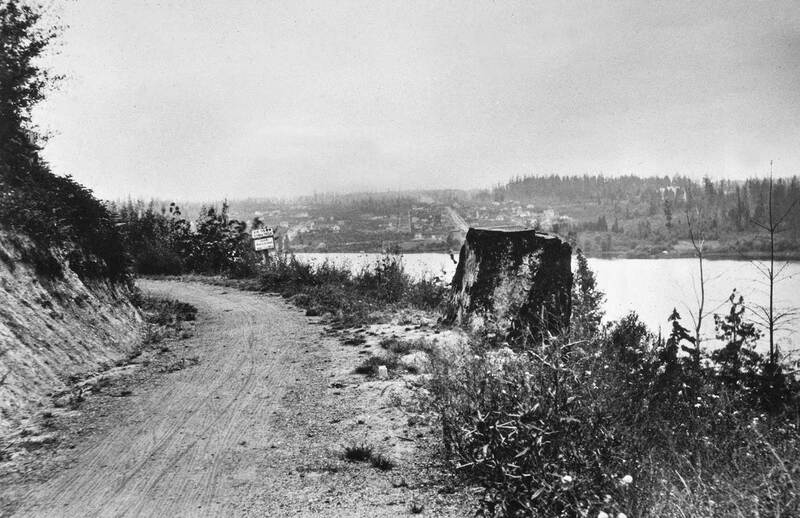 The cinder path between downtown Seattle and Leschi Park was opened June 19, 1897. The point was not to get to Lake Washington quickly, but athletically. 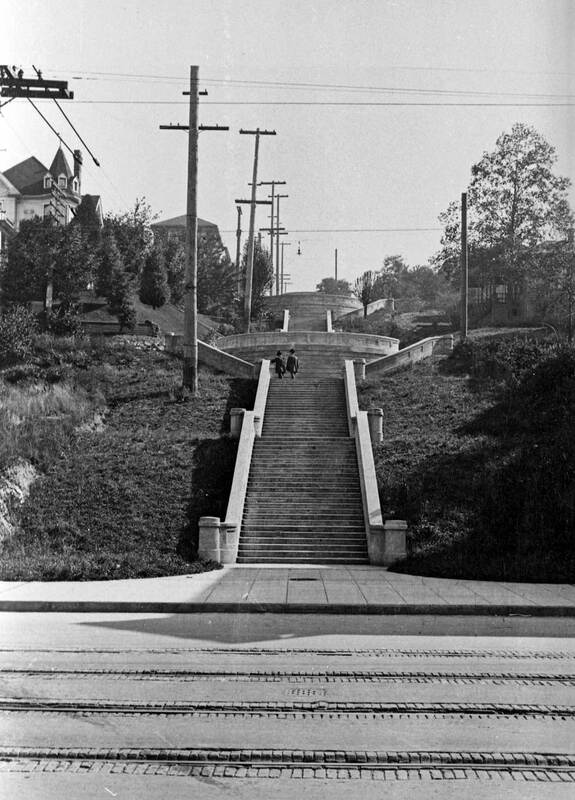 So the trail -built by the Queen City Cycle Club before there were any motorcars in Seattle -wound around the north end of Capitol Hill. After 10 miles the cyclists reached Leschi Heights. And they did it with one gear. 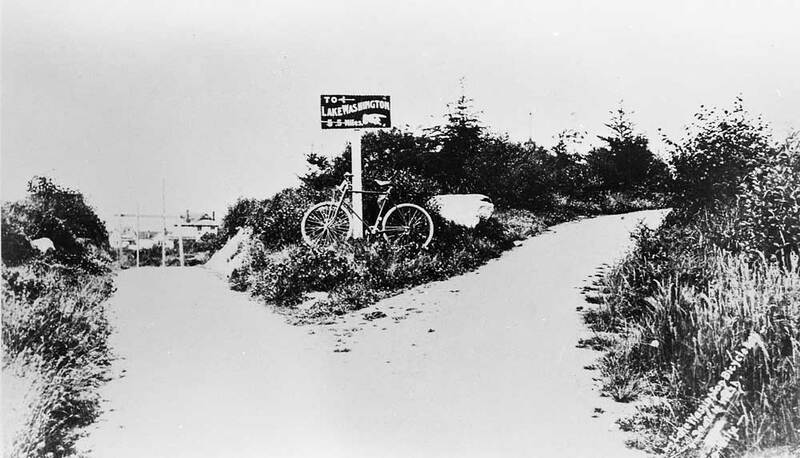 Interlaken Boulevard was developed out of the bike path and the contemporary view (after we find it) was photographed within a few feet of the position taken by Soule for his North-End panorama. This section of the boulevard is just below Seattle Preparatory School. A scene along the path - probably the path to Lake Washington. (First appeared in Pacific, Dec.16, 1990.) 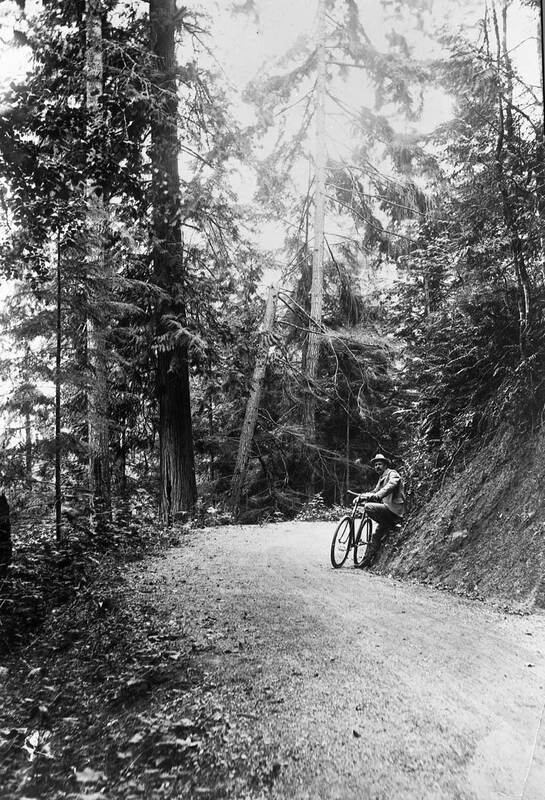 The rustic charm of the Good Roads Lunch Room was enjoyed by tired bicyclists pedaling the miles of cinder path that twisted along the wooded ravines at the north end of Capitol Hill. 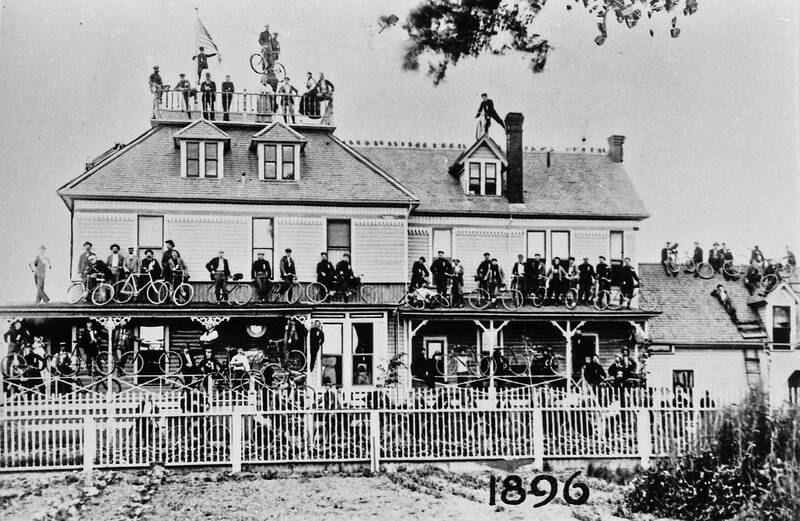 This sandwich shack was the 1897 creation of the Queen City Good Roads Club, an organization of bike activists who also built the cinder trail between Lake Union and Madison Park. largest canyons between Roanoke Street and 23rd Avenue, the part of the bike trail that is now Interlaken Boulevard. 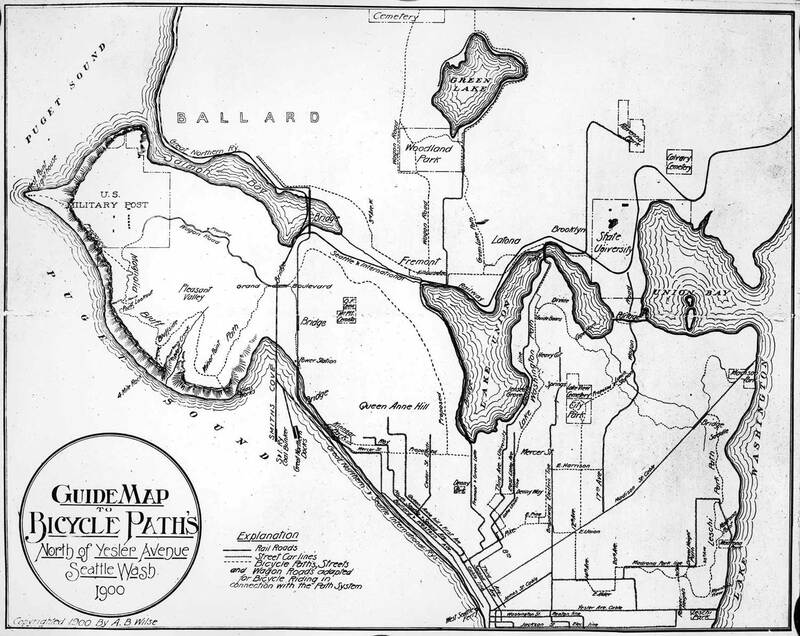 A crude “Guide Map to Bicycle Paths,” published in 1900, places the lunch stop near where the then-proposed trail to Volunteer Park (now Interlaken Drive) was to meet the Lake Washington bike path. Some of the signage in this detail of the Good Road half way house can be made out - or nearly. There is a sign for Lemonade, another for Milk Shakes (well, the "Milk" is easier to read that the "Shakes") and three prices are indicated on a blackboard at the door: 10 cents, 20 cents and 5 cents, although I cannot make out what they will purchase. Given these hints, it seems likely that the Good Roads Lunch Room was at the curved apex of the large ravine just east of where Interlaken Drive now meets Interlaken Boulevard. Of Cotterill’s two big canyons, the eastern ravine is much closer to Interlaken Drive, which climbs the ridge just above it. 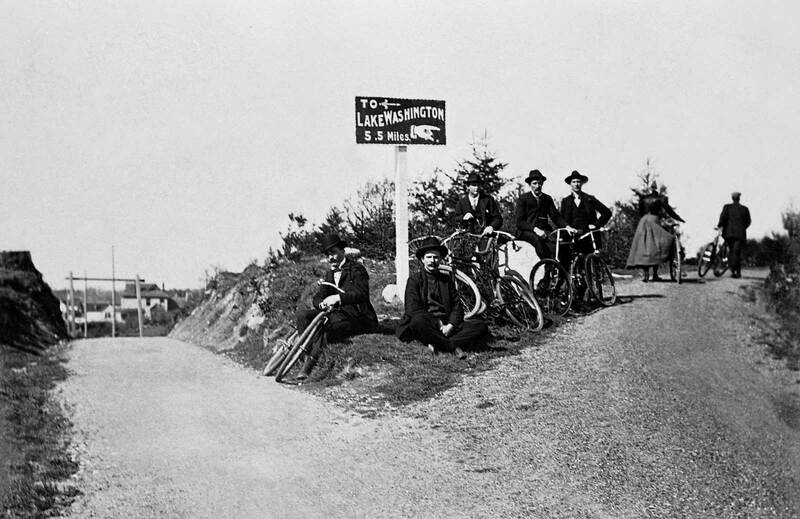 The Good Roads Lunch Room was as short-lived as the cinder trail and the early bike craze. In 1905 Interlaken Drive and the eastern half of Interlaken Boulevard that extended from the “Y” to 23rd Avenue -the part that included the Lunch Room site – was widened and converted into a boulevard for motorcars. In 1908 the other (western) half of Interlaken Boulevard, between the “Y” and Roanoke Street, also was included in the city’s growing boulevard system. (This first appeared in Pacific on Jan. 24, 1993.) 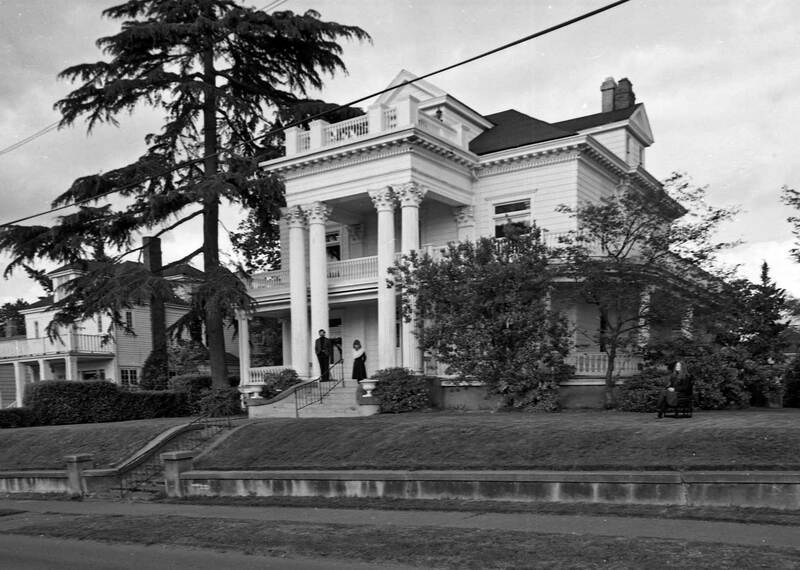 The Society of the Sacred Heart of Jesus opened its first school for girls in Seattle in an oversized Capitol Hill home in 1907. Its stay was short-lived when anxious neighbors objected to the sisters’ plans to expand. So the school, which was also a convent, moved further north to a spectacular sight 300 feet above Portage Bay, where this brick and sandstone landmark was speedily built and dedicated in 1910. The name Forest Ridge was adopted to avoid confusing the new institution with the local Orphanage of the Sacred Heart. 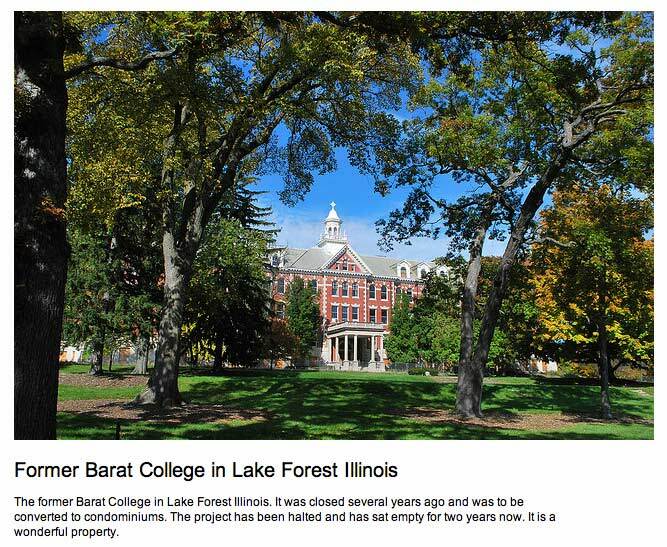 In his history of Forest Ridge, Seattle historian David Buerge relates how the school’s layout was snipped with scissors from the floor plan of another of the order’s schools, Barat College in Lake Forest, Ill. The collage was handed to Seattle architect F. A. Perkins, who fit it into this neo-classical construction. Low resolution likeness - Barat College with its own caption grabed of the net. The first 63 students began classes two weeks late when the school’s furniture was slow to arrive. The day students came mostly from surrounding neighborhoods; the boarders came from everywhere in the Northwest. 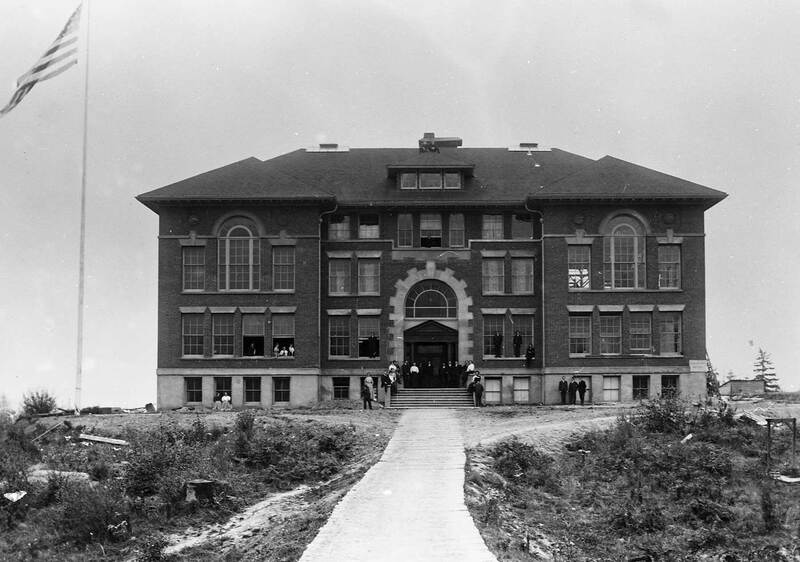 Enrollment reached 160 in 1927, but crashed during the depression to only 54. Enrollment rose steadily after World War II, reaching 340 pupils in 1958. Thirteen years later, the Forest Ridge school moved out and up 500 feet to Bellevue’s Somerset Hill, 800 feet above Lake Washington, where this year 242 students are enrolled in grades 5 through 12. Since 1972 the order’s old plant on Interlaken Boulevard has been the home of the Seattle Hebrew Academy where, this year (1993), 263 primary-level pupils study a curriculum of general and Judaic studies. 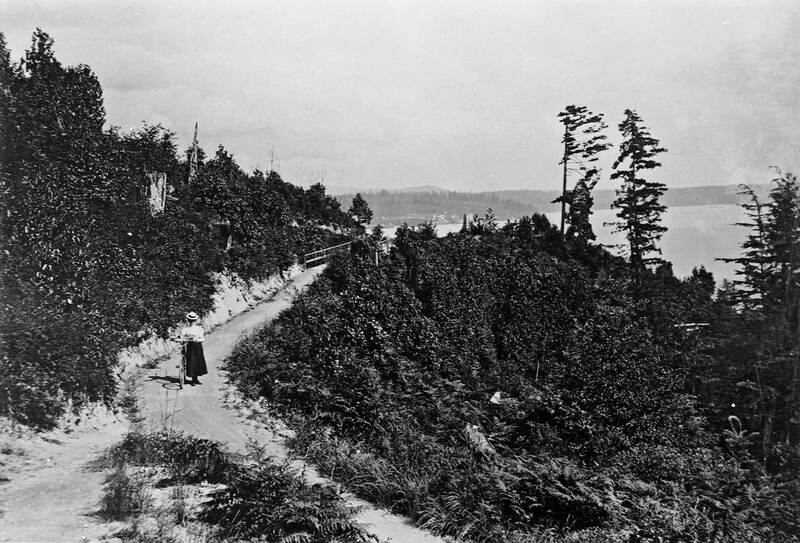 For a few exhilarating years around the tum of the century, bike riding was a popular craze in Seattle, and the building of bike trails around its hills an ingenious engineering trick. Those were the early pre-gear years of bicycling. But which tum in the snake is this? 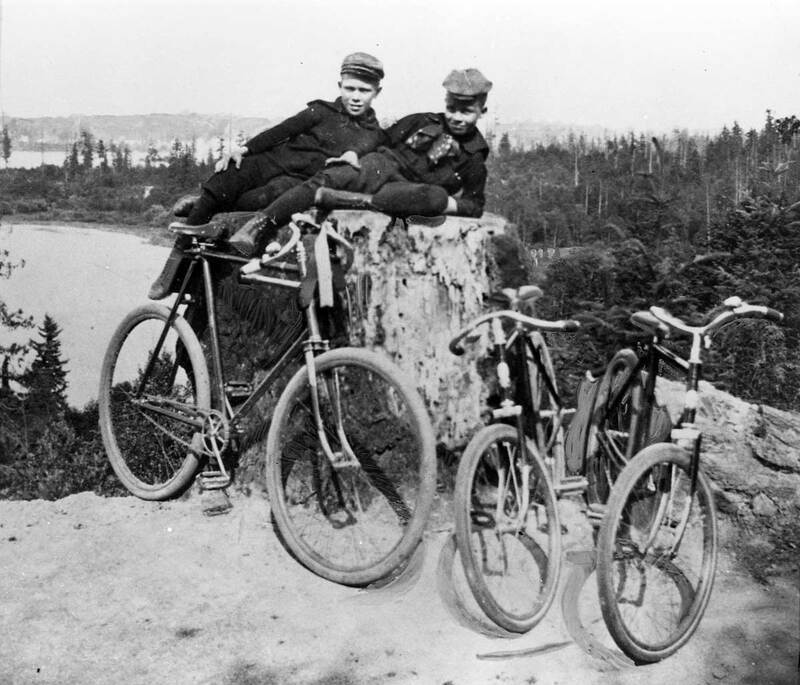 As often as I have seen this popular photograph in exhibits and publications none of them, including the excellent short history Bicycling in Seattle, 1897-1904 by Seattle’s bicycle authority Frank Cameron, has pinned it down. So 1 first went searching for Frank Cameron and a caption for this photo more precise than the usual generality “along the bike path.” And 1 found that the one-time master mechanic for Bucky’s bike delivery service was now (in 1986) “repairing” or moving humans with his new duties at Traveler’s Aid. Frank and I put our heads together, switched a few gears and soon determined that this view rather quickly gives itself away. As surely as a fingerprint, the profile of the horizon and the shape of the shoreline identifies the first land across the water as Mercer Island. And more precisely, that is Mercer Island as seen from what was then called Leschi Heights. So this is near the Leschi Park end of the Lake Washington Bike Trail and more than ten wild but relatively level cinder-surfaced snaking miles out from the city center. Frank also remembered from his research that it was here that the cyclists who did not tum around faced a fork in the road, and both ways were steep. The one descended to the amusements at Leschi Park and the other to the top of Leschi Heights. The trail’s split at the photo’s lower left comer may be that fork. The Argus editor, concluded that this was a “wheelman’s paradise” where “lost in the forest . . . among the birds that spring from twig to twig . 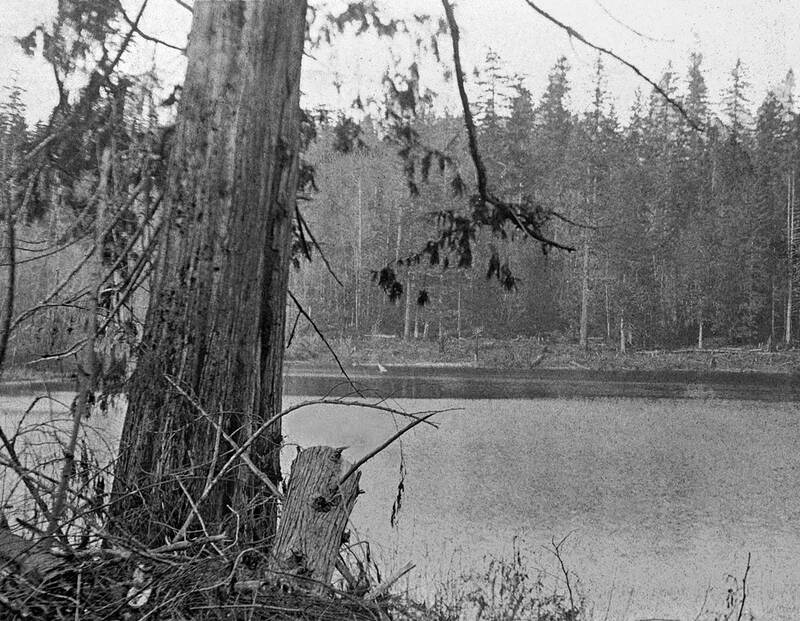 . . he drinks in pure air and thanks God for the power which enables him to appreciate nature.” Frank Cameron adds that in 1901 warnings were issued on Capitol Hill about bears frightening bicyclists on the Lake Washington Bike Path. Much of the old and short-lived bicycle path was eventually transformed into city streets – notably the scenic Interlaken Blvd. that still winds through the woods at the north end of Capitol Hill. (First appeared in Pacific June 10, 2001.) The Topography of Seattle, our picturesque ridges and waterways, has predisposed us to exercise. We may not make a habit of climbing Queen Anne Hill, but if we live on it or any of the 37 or so other hills and hillocks hereabouts, even the most sedentary among us may well have to huff-and-puff to our own front door. That, too, counts as exercise. But what of reclining in a canoe? 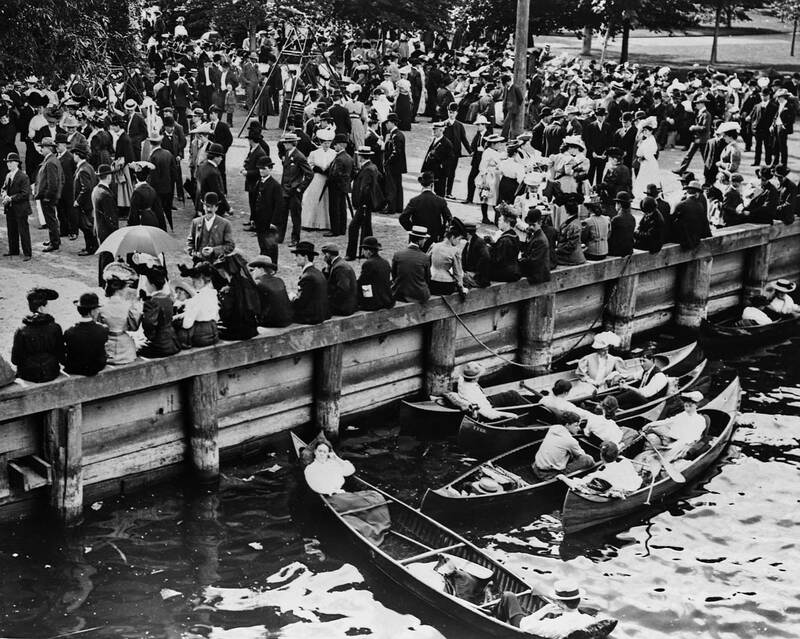 Here on the Leschi waterfront nearly a century ago is a crowd that surely delights in itself. Whether pausing on the promenade, sitting on the bulkhead or resting in a canoe, these are mostly young people who otherwise might have been stretching. Did they, by the end of this day, say in the summer of 1906, also feel the great satisfaction of endorphins got from paddling across the lake? Or the lingering excitement of stretched sinews from biking back to town? 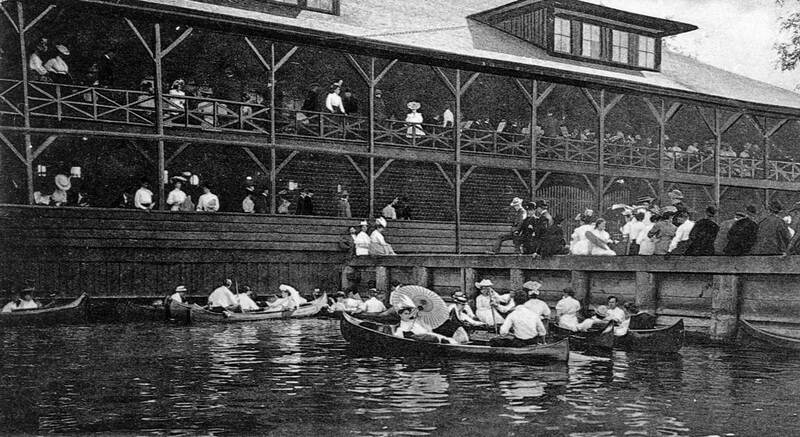 At the east end of the old Indian trail between Pioneer Square and Lake Washington, Leschi quickly developed into one of Seattle’s first pleasure gardens, especially after the electric trolley was completed along that same trail in 1888. Nine years later it was possible to pedal to Leschi very indirectly on a trail around the north end of Capitol Hill, and for about a dozen years biking kept its popularity. Despite vast quantities of lard and sugar consumed, we were in 1900 perhaps as fit a city as we have ever been. The convenience of the motorcar increasingly softened muscle tone. Today at Leschi the descendants of this lakeside society have moved down a ramp to the locked dock where they keep their sailboats. For a scene as snug and exercise-driven as this it is now best to look through the great plate-glass windows of our many exhibiting health clubs. The Leschi Park Pavilion, home for theatre, concerts - and beer. Next we will return to surviving landmarks – a school and an apartment building – that are near the fork in the path at – or near – Boylston and Roanoke. The second Seward schoolhouse looks down and west over Rogers Playfield towards Lake Union. (First appeared in Pacific on May Day, 1994.) All three of Seward school’s historic structures survive and are used side-by-side. What’s still called the “new” plant was built in 1917. This slender brick structure looks over Boylston Avenue East to Interstate 5. South of it facing East Louisa Street nestles Seward’s oldest building. 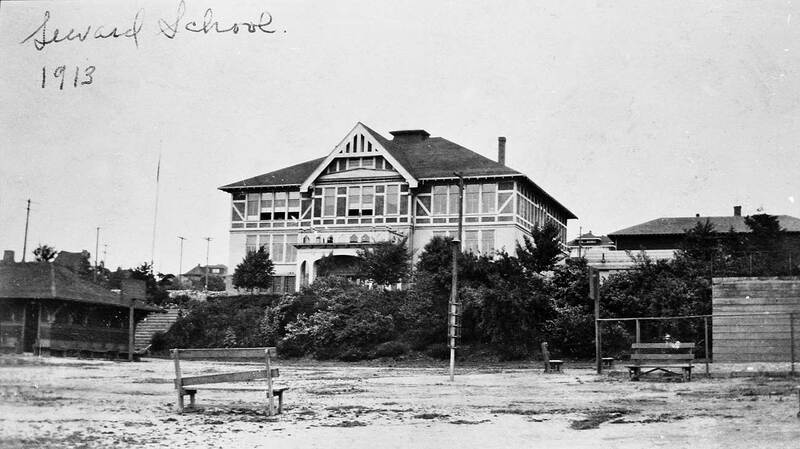 Built in the sticks of north Capitol Hill in 1893, it was first named Denny-Furhman School for the families that owned most of the land around the school. The 1917 addition of the large brick plant now behind it diminished the elegant impression this structure made on those passing below on Eastlake Avenue East. However, in the early 1960s when 1-5 bisected the neighborhood the “new” brick building served as a sound buffer for the older frame school house behind it. By 1970 practically all classes – except the already noisy music class – abandoned the brick plant for the relative peace of this timbered school house. In the inid-’70s, parents defeated the school board’s attempts to close the school. Since 1990 Seward has been the home of TOPS, an alternative program that emphasizes innovative teaching techniques and parent involvement. Perhaps some of TOPS’ 400-plus students will eventually be numbered among Seward’s distinguished alumni, along with Pearl Wanamaker, former state superintendent of public instruction; Pulitzer Prize winner Edwin Guthman; and molecular geneticist Dr. Henry Erlich. 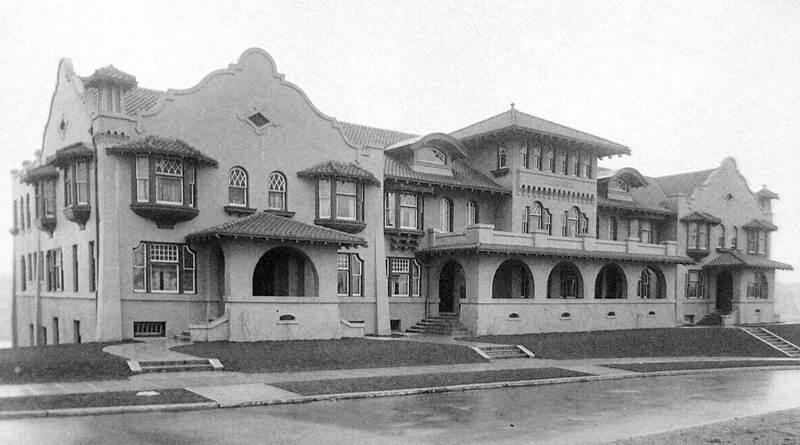 When new in 1909, the L’Amourita apartments at the northwest corner of Franklin Avenue and Shelby Street were a unique Northwest example of East Coast townhouse living built in a Southwest style. The L’Amourita has been a cooperative since the 1950s. 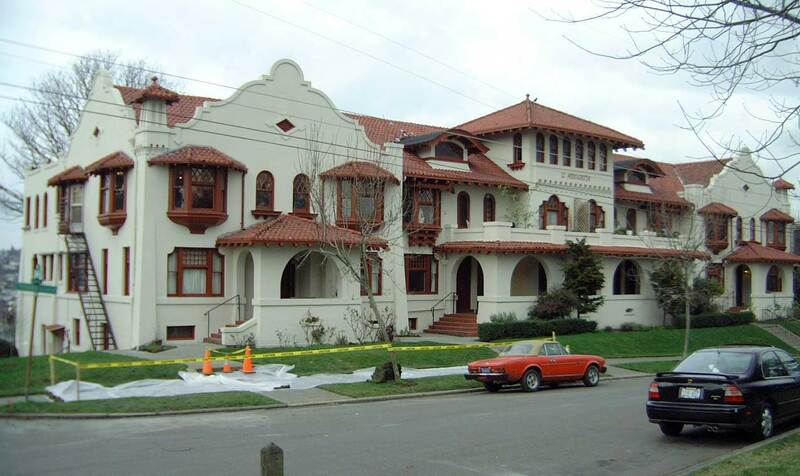 (First appeared in Pacific March 3, 2002) L’Amourita, the Spanish Colonial apartment named for lovers, was a half-century old when its tranquility was first interrupted in 1959 by construction of the Lake Washington Ship Canal Bridge above it. 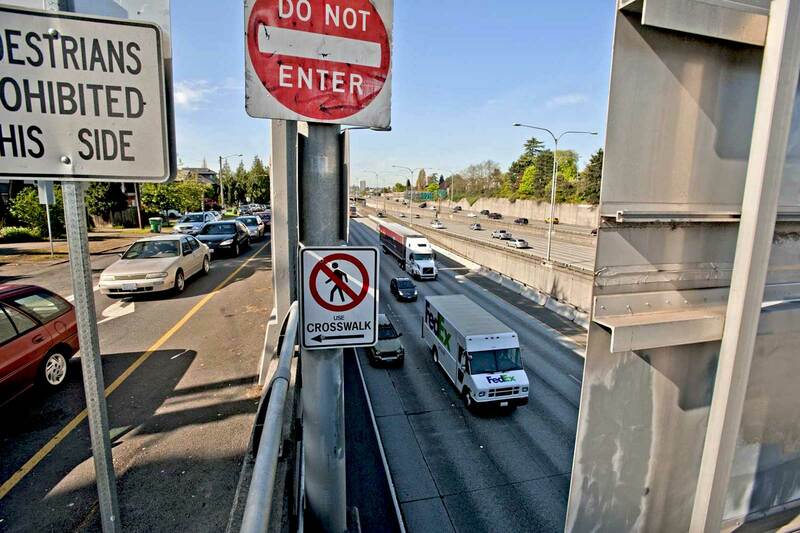 The bridge was completed in the fall of 1961, and tenants in the 21 units at L’Amourita would have a year’s hiatus from the noise before that first Seattle section of Interstate 5 opened to traffic. With exterior concrete walls 22 inches thick, L’ Amourita was built nearly for eternity. “I think most of Seattle has lived here at one point,” says present board president Lysa Hansen. (First appeared in Pacific on Feb. 5, 1995) Soon after Rezin Pontius’1865 arrival in Seattle, he sent for his wife Margaret and son Frank, who followed him from Ohio by way of the Isthmus of Panama. The family grew in numbers and wealth – five children and much land. Then suddenly Rezin fled his family and fortune. He left unannounced and his wife, who never mentioned his name again, did not learn of his destination – California – until years later when Rezin contacted his sons. Margaret Pontius, who was described as sometimes darkening her great charm with the shadow of a bad temper, was quite capable of making do without him. 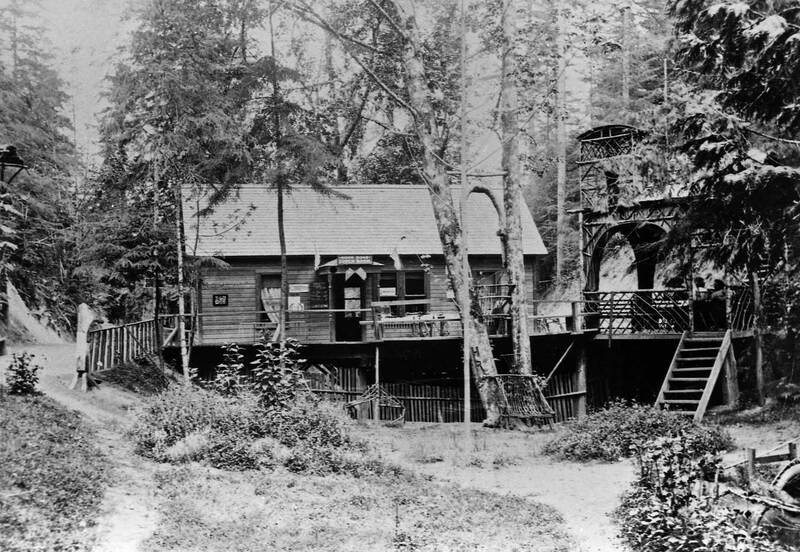 The family fortune grew, for the Pontius homestead in the future Cascade neighborhood between Denny Way and Lake Union was in the path of a Seattle expansion that exploded after the city’s “Great Fire” of 1889. That year Margaret built her mansion. The architect, John Parkinson, is described by Jeffrey Ochsner in the University Press book “Shaping Seattle Architecture” as a “major Seattle designer” in the years following the ’89 fire. Later Parkinson continued his distinguished career in Los Angeles. Parkinson chose the then-popular Queen Anne style for Margaret Pontius. 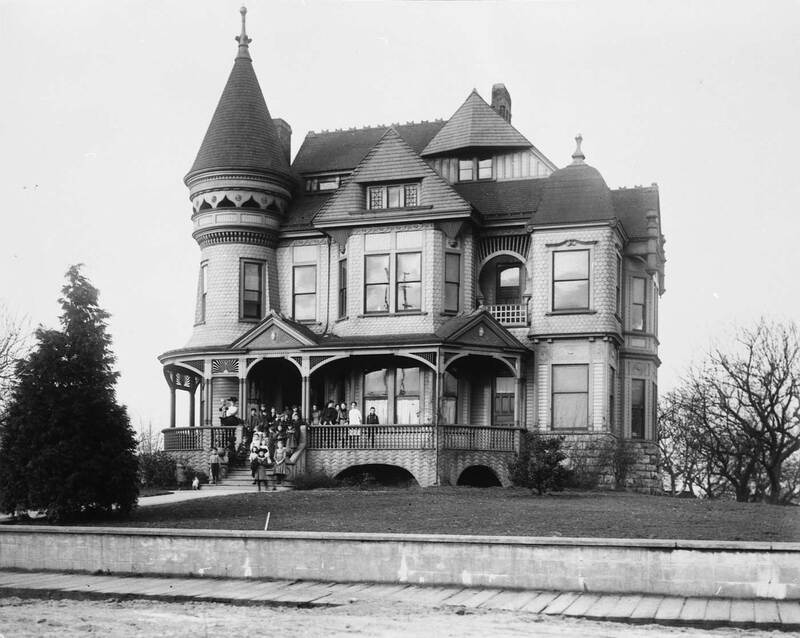 Margaret lived in her mansion at Denny Way and Yale Avenue until her death in 1902. Rezin, who had returned to live with his oldest son Frank in Bothell, died 16 years later. In 1905 Margaret Pontius’ children rented the mansion to the Mother Ryther Home for orphans. It served as an orphanage until 1919, when the Rythers moved to larger quarters in Wallingford. (Since 1958 the Ryther Child Center has been located at 2400 N.E. 95th St.) The landmark Pontius mansion survived until 1930, when it was replaced by a garage for the North Coast Transportation Company, a predecessor here of the Greyhound Line. (First appeared in Pacific on Oct. 14, 1984.) 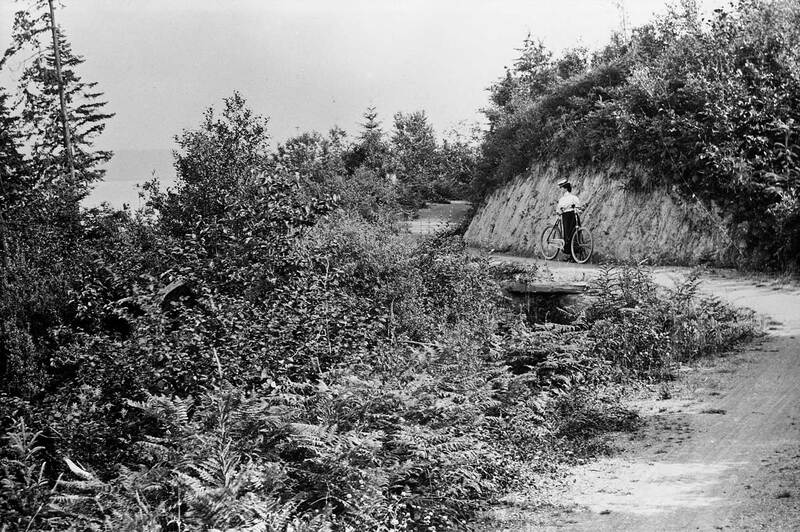 Included on our imagined list of lost places is the Republican Hill Climb. This elegant stairway was designed to reach higher than the hill. Its grand qualities were meant to be enjoyed for their own sake. And for half-a-century they were. The climb’s design involved three half-block sections. Each was comprised of two single stairways and one double, or branching staircase that circumvented a curving wall. Frank Shaw looks south thru construction on the Seattle Freeway (I-5) north of Denny Way. Shaw dated his slide May 30, 1962. I remember well the apartment building facing Eastlake Ave. on the far right. It was, at least, near Republican. Above and below: four women – in all – on two bike paths. I have not determined where the above photo was recorded, however the curving rail on the far right is a fine clue. That and the lay of the land. Perhaps a reader . . . . 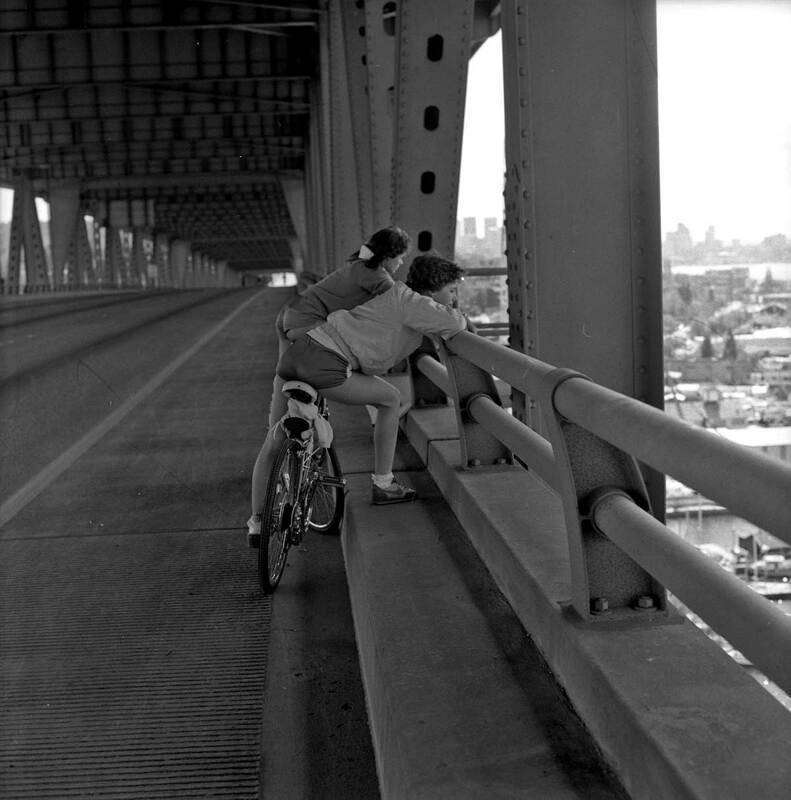 The scene below, like the freeway construction shot above, is by Frank Shaw, but twenty two years later in 1984. Here the bike path is the lower express level of the Lake Washington Ship Canal Bridge, which has on occasion been closed for the sport of cyclists and joggers. Why there are only two here is puzzling. We have expectations of more features for these bikeways – if they come together pretty much on their own and a little help from a few friends. Previous PostOur Daily Sykes #380 – YellowstoneNext PostOur Daily Sykes #381 – Like a Nascent Nile Temple . . .